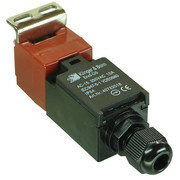 Limit switch with 2 openers for protective covers, doors, have paw actuation on the side or end face. The pawl is e.g. Mounted on a door, The switch on the frame. The actuation takes place when the latch is engaged in the switch.. When the jack is inserted into the switch (as shown), the contacts are closed. If the jack is pulled out of the switch, the contacts open..
Safety limit and position switches are specially designed for protective covers, doors, hoods, etc. 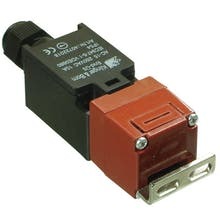 In contrast to the conventional limit switches, they differ by security against manipulation. This means that an actuation of the limit switch can not be effected by means of simple means such as screwdrivers, rotating blocks, etc.